Are you making vertical video as part of your social video creation for business? If not then it’s time to flip video on its head (or at least turn your phone sideways a little). Vertical Video is here to stay and in this post we discuss why it’s popular and why you should consider creating vertical videos. 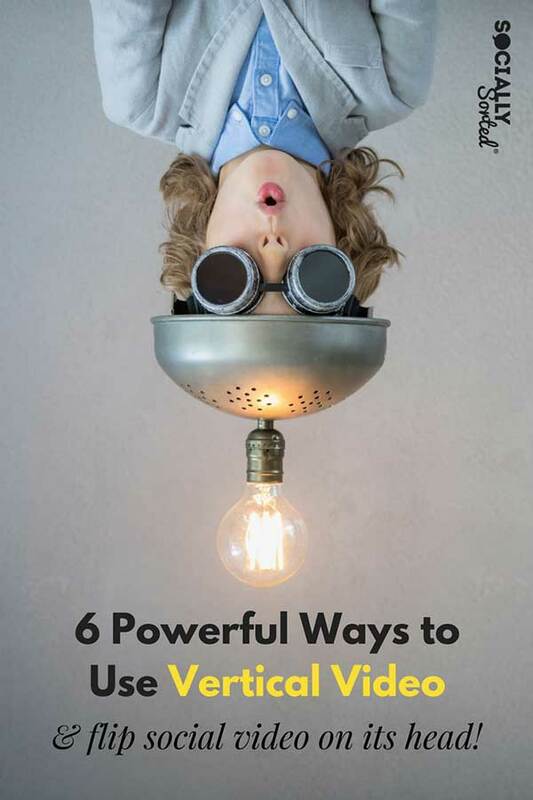 Snapchat and Instagram Stories have changed the way we connect with each other – and with that the way businesses can engage with their audiences. 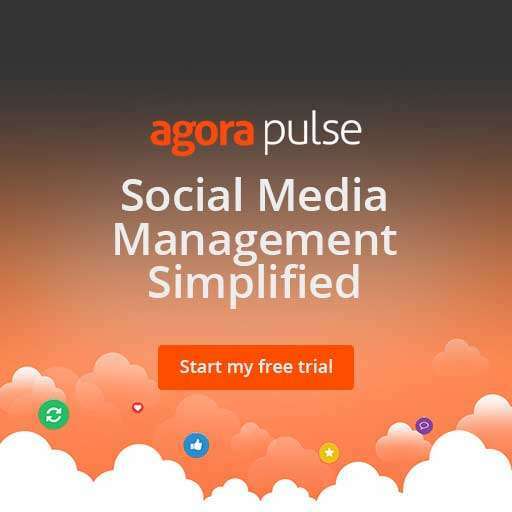 And now they are changing the way we create social video. Instagram Stories is now at 300 Million Daily Active Users. Snapchat is at 173 Million Daily Active Users. These are no small figures. And then if you look at Facebook having 1.74 Billion (with a “B”) Monthly Active Users on Mobile, we’re drawn to ask… what common thread ties these stats together? We naturally hold our phones in a vertical position. Think about what this means for your video content creation. Now, I’m not saying we need to change everything to vertical video. YouTube, Movies at the Cinema.. these things are pretty sacred and I can’t imagine them changing. We’ve been watching TV and movies in landscape position for more than 60 years, and that’s ok. I like it that way. But we are evolving to communicate, engage and be entertained in new ways as well. Living mobile lives, we often communicate and consume content with our phone in a vertical position. Scrolling the Facebook newsfeed, snapping on Snapchat and watching Instagram Stories … are typically done with our phone flipped vertically. And it kind of makes sense that content will perform better if it is created to suit the way in which people are holding their phones. Vertical video is just likely to do better on those platforms because it makes sense intuitively! So we should optimize for vertical video on the platforms that embrace it. That’s what this post is about. Giving you some new “options” for video so that you can leverage the fact that people are consuming video in the vertical position. It’s tempting to stick with old habits and go landscape if you are capturing video. But try it in portrait mode! 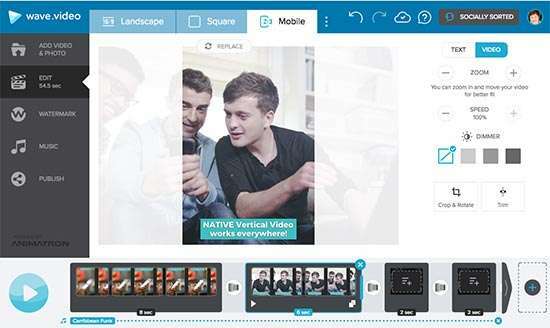 If you choose to capture some video snippets in vertical format vs horizontal, then you’ll have more options with some of the ideas below for showcasing your video on various platforms. It continues to be harder and harder to get organic reach on Facebook, but video is one medium that still tends to do better than any other type of post. Facebook wants us to be uploading video. 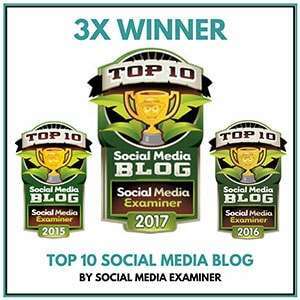 When it comes to the format for that video, square and vertical video formats are your best bet with video on Facebook (compared with horizontal). 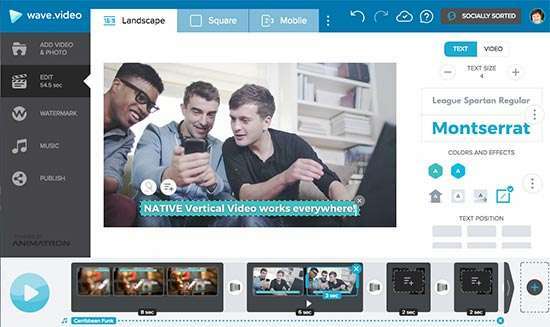 Square video performs better than landscape video. We are 67% more likely to watch a square video to completion than a horizontal video (according to Adweek). And vertical video is also just as successful compared to horizontal video on Facebook. It drives 9x the engagement of horizontal video on mobile. So how does Vertical Video Work on Facebook? It’s simple. Not so long ago, video that was vertical was shrunk down to fit in a small square within a horizontal or square video post. Now it defaults to 2:3 aspect ratio on both Android and iOS phones. If the viewer simply taps the screen it will expand slightly further for the video to take up the entire mobile screen – no obtrusive buttons or functions get in the way, as it’s optimised for user-experience. So… keep your phone in the vertical position the next time you come across something great to capture on video! 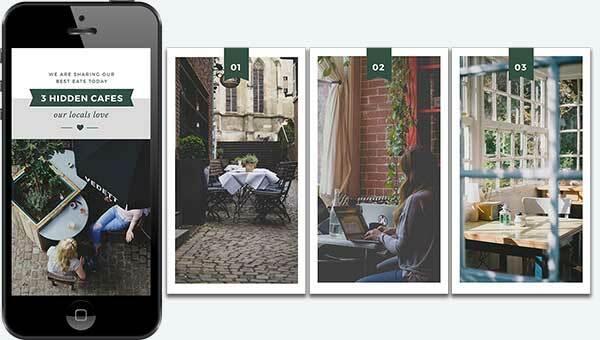 Your vertical video will display at 2:3 aspect ratio with full screen expansion with one tap! 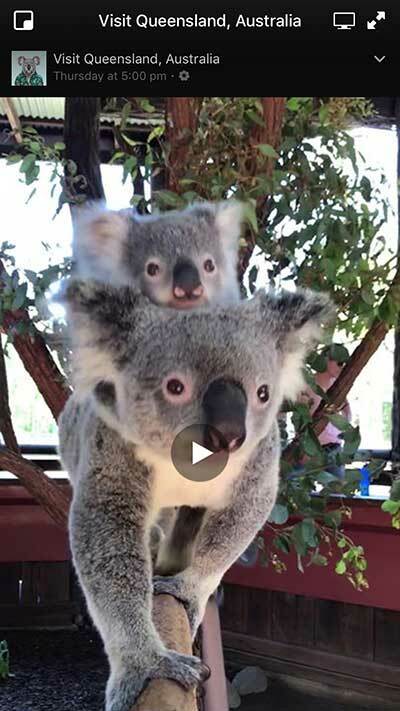 Vertical videos will auto-play (so be sure to consider adding captions as many people play video with the sound off). Your verical video will open in a picture-in-picture format if the person viewing the video chooses to keep scrolling while watching your video. It’s time to get to know Instagram Stories. It’s a great way to tell your brand story using a mix of images and short 15 second video snippets. 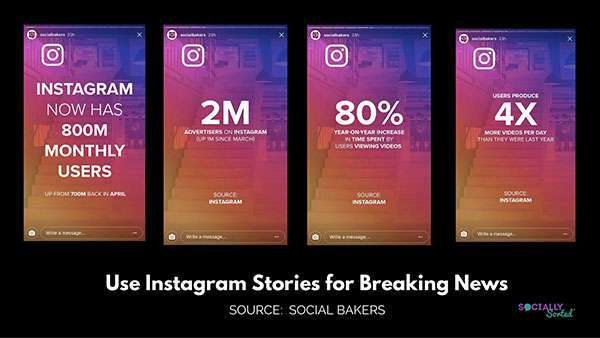 Instagram Stories is growing massively, and it’s the perfect way to engage with your audience, and take them behind the scenes to meet the people behind your business. Here’s 7 Easy Ideas for Instagram Stories to get you started. Remember you can add a mix of photos or video so taking vertical video is super important as Instagram Stories are shown in vertical format. It’s great for capturing a quick interview, going face-to camera with a tip, sharing behind the scenes, taking us on a tour or more! And if you need a little helping hand, check out #3. I’ve posted about Instagram Story Templates before and they are fitting to mention here now. Having a framework for telling your story can take the hard work out of it as you already have someething to work with. Now that we have established that you you should record vertical video and that you should post it to Instagram Stories, there’s just one hitch: Instagram Stories only allow you to upload videos from your camera roll that are less than 24 hours old. Storeo is your new best friend when creating Instagram Stories with Vertical Video. 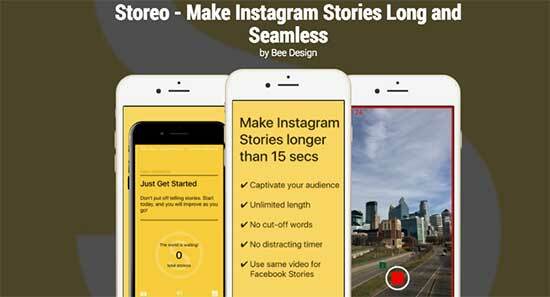 Storeo is an iOS app that allows you to take ANY video (yes, any video, no matter how old) and upload it into Instagram Stories. 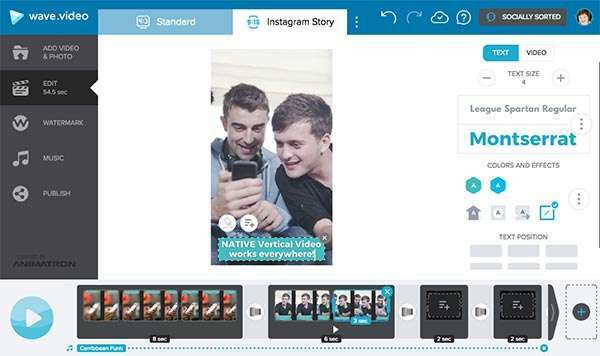 You Simply upload your video from your camera roll into Storeo and it splits the video into 15 second snippets that you can then easily upload into your Instagram Story the normal way, one 15-second video splice at a time. Congratulations. You just hacked your way around Instagram Stories without breaking any rules! I’m sorry I don’t know any versions of this app on Android. Most of the alternatives all appear to be iOS but if you find one let me know. I just like Storeo. It works well. Facebook is optimising for and supporting (and promoting!) vertical video ads, so it’s worth including these into your marketing mix if you are promoting content to mobile users. The same goes for Instagram where vertical video ads have been featured since November 2016. Vertical video ads take up more space on the newsfeed, giving your brand more attention than a regular square or horitzontal ad. Research by Facebook has shown that vertical video ads drove an increase in ad recall and users watched the ads for longer and with the sound on. These types of results have been replicated and it’s pretty clear that vertical videos outperform horizontal videos on Facebook ads – in terms of cost per view, reach, engagement and video completion rates. If you want to see how stunning vertical video can be in ads, check out Facebook’s Canvas Ads here. Here’s one of their examples from Carnival Cruise Lines. Vertical scrolling is stunning, you can scroll left to right as well (it’s just like exploring every inch of a real-life canvas!) 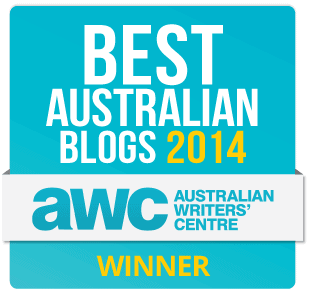 and they are clickable too. Image from Facebook. Check the full article here. I think we are seeing just a drop in the ocean of what Facebook has planned for vertical ads, so consider them for your next campaign. Instagram Stories Orientation (9:16 orientation). Whatever the format you need, it’s easy to switch. Choose your videos with both formats in mind. Some will convert better than others, but you’ll see what works best with some experimentation. You can start creating vertical videos with Wave here. Start simple… start with taking some more vertical footage on your phone. Then expand it from there. It may be that some vertical videos are not showing entirely as vertical in preview and may crop to square before the user taps on it to make it full screen. Keep any text or important content to the middle section if you can, just in case it is cropped to square. 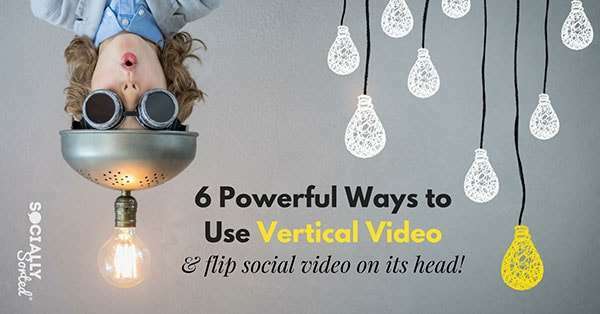 Don’t limit “vertical” to just vertical video. You can go vertical for images, GIFs and more! Again, tools like Easil’s templates can be great for creating GIFs. Have fun with vertical video for your social video creation! Are you using Vertical Video on Facebook or Instagram or Snapchat? Will you start to now that you know that your customers are most likely consuming vertical video on their phones?